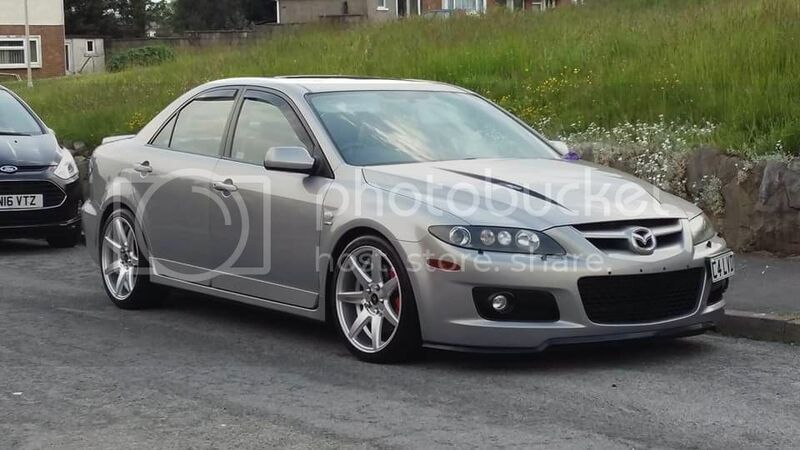 Ok guys mazda 6 mps for sale. In good condition. Arches are rust free. Minor chips on bonnet. has a longlife stainless steel exhaust. But did roll 300bhp on rollers. Alloys are includes if full asking price paid. £3000 ovno this car is a bargain and needs to be sold this weekend or its going in part ex. Wisseco pistons, Manley h beam rods, Arp main stud kit, Arp head stud kit, Fidanza ali flywheel, Cpe Balance shaft delete, Damond Egr delete kit, Inlet manifold butterfly delete, Coolent bypass, Cpe injector seals, Htp 3" intake, Aem cone filter, Bnr stage4 turbocharger, Grimspeed 3port bcs, Bosch 3bar map sensor, Ngk 1 step colder, 3" catless downpipe, 2nd decat delete, Cxracing custom pipes, Treadstone tr8 fmic, Sure short shift kit, Mme solid shifter bushes, Custom 676g gear knob, Xspower manifold, Devils own meth injection, Forge recirc valve, Autotech hpfp, Jbr thermal intake gasket, Hel stainless lines, Rear defuser, jbr air dam, Mk2 alloys, Versatuner.